Trine Opsahl is a composer and talented harp musician. Joining forces with her daughter Josefine on the cello, this duo has created a new album of Nordic and Celtic folk music. The album sticks with you long after the playing is over. Thirteen original pieces composed by Trine bring a blend of contemporary and classical elements and improvisations that grab hold and let your imagination take flight. 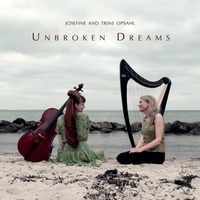 Unbroken Dreams is Trine Opsahl's fourth album. The first piece on the album is "The Last Grasp of Winter." It begins with a fluttering harp sequence that made me instantly think of snowflakes. The cello eases into the picture, eliciting images of sweeping snow covered hills and icy winds determined to keep their hold over the world. But then the tone of the piece changes. A lilting flower winds its way open amidst the frosty backdrop. One crimson bloom against the frigid air…and spring struggles to take hold once again. Thus the dance of the seasons begins, all set to the elegant melodies of harp and cello and the artisan workmanship of Trine and Josefine Opsahl. I can think of no other perfect title for "Fairytale." Listening to this album, I wrote my latest manuscript and this piece in particular reached down and lifted the story from my writer's heart. Sweet and tender, you can hear the hero coming to the rescue of the damsel in distress or even a beauty waking from an enchanted sleep in the loving arms of her prince charming. Winding sequences of cello and harp craft a spell that any lover of Celtic music will absolutely adore. "Drifting On Silky Clouds" begins with a pensive cello movement reminiscent of a storm passing over. Sweet, fluffy clouds drift in, both dark and light fighting for the right to take over the sky. Sunlight shines through the cloudbank, drifting down in radiant harp sequences that enliven the soul. Drifting melodies spiral and twist through the air, an audible dance of majesty. Trine and Josefine Opsahl are a marvelous mother and daughter duo. Unbroken Dreams is a brilliant combination of Celtic and Nordic tradition blended with contemporary inclinations. The spiraling nature of each piece was like a flower bursting open, with new discoveries every step of the way. I couldn't stop listening and don't plan to any time soon. There is a reason Opsahl's work is used as soundtrack material in documentaries. It's that good. And now with the added layer of her daughter's cello work, I'm hooked for life. More please. This album is amazing. If you are a fan of fantasy novels or just plain good music, you seriously have to get this album.